FRANK SEDDIO’S ST. JOSEPH’S DAY IS A THROWBACK TO OLD CANARSIE: Every year for the past 11 years, Hon. 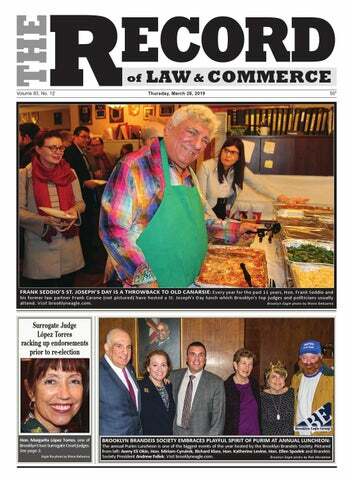 Frank Seddio and his former law partner Frank Carone (not pictured) have hosted a St. Joseph’s Day lunch which Brooklyn's top judges and politicians usually Brooklyn Eagle photo by Mario Belluomo attend. 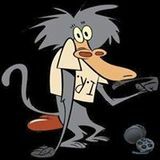 Visit brooklyneagle.com. The city violated the law in rezoning a Fort Greene development site, a lawyer for neighborhood residents argued before a judge on March 19 in a court case that could have implications for development projects around the city. This case is significant because it challenges a trend of developers easily winning the City Planning Commission’s permission to disregard zoning that protects neighborhoods from dense, high-rise development — zoning that was established with the consensus of community residents, elected officials and the City Planning Commission itself. When the City Planning Commission and the City Council voted in 2018 to permit developers of 142-150 South Portland Ave. to build a 13-story tower, the city flouted the 2007 rezoning of Fort Greene and Clinton Hill “to the detriment of local residents,” Jack Lester said in his March 19 oral arguments before New York Supreme Court Justice Lynn Kotler. Their decisions resulted in illegal “spot zoning,” Lester argued. Case law defines this as zoning that allows an owner to use his property in a way that is totally different from others in the surrounding area — and that owner is the only one who benefits, while owners of surrounding properties suffer harm. Lester represents a group called Preserve Our Brooklyn Neighborhoods and more than 50 individual residents. They filed suit last October against the City Planning Commission, the City Council, Metropolitan Development Group Design and Construction and the Hanson Place Seventh-Day Adventist Church. The church owns the development site. The rezoning the developer and church won allows them to construct a 13-story residential building, which is taller than what’s normally allowed by the neighborhood zoning. income of $58,480, according to data provided by Preserve Our Brooklyn Neighborhoods. The other units are for tenants earning 100 percent of area median income, meaning an individual who makes $73,100 per year; or 130 percent of area median income, meaning a single person with an annual income of $95,030, the data indicates. ‘Zoning is not static’ Lester argued at the March 19 hearing that the 2007 rezoning of 99 blocks of Fort Greene and Clinton Hill provides developers with incentives to construct affordable housing in the area — and the church and developer shouldn’t have been given additional sweeteners to do so. Elizabeth Kim, a New York City Law Department attorney, countered Lester’s arguments by saying the 142-150 South Portland Ave. rezoning should be considered legal because it was meant to promote the welfare of the community. And the 2007 neighborhood rezoning was not meant to last “for time immemorial,” Kim said. “Zoning is not static,” she argued. So what happens next? Justice Kotler could make her decision in a matter of weeks. If she decides the Fort Greene residents are right, the church and developer can build a 70-unit affordable apartment project that’s 95 feet tall. Such a decision would send a message to New York City developers that they can’t always expect to be able to disregard zoning that was crafted with community members’ consensus. If she decides the church and developer are right, they’ll start work on their 13-story project. And other developers may redouble their efforts to get zoning variances for high-rise development in Fort Greene and Clinton Hill. Hon. Margarita López Torres, one of Brooklyn’s two Surrogate’s Court judges, is running for re-election this June and has a lot of backers from Eagle file photo by Mario Belluomo around the borough. rooklyn Surrogate’s Court Judge Margarita López Torres is running for re-election in the June 25 Democratic primary and after running as a symbol of an independent judiciary in her last two elections, the justice has no shortage of support this time around. Justice López Torres was recently endorsed by Congressmembers Nydia Velázquez and Hakeem Jeffries, two of the most visible Democrats from Brooklyn. She was also endorsed by Borough President Eric Adams recently, and her list of past endorsements is long as well. “I’m proud to be supporting Judge Margarita López Torres for re-election for Surrogate’s Court Judge,” Public Advocate Jumaane Williams said. “With 40 years of legal experience, and over 26 years of judicial service, her excellence and compassionate commitment to serving the people of Brooklyn throughout her career is well known. “She has demonstrated competence in managing this complex court, and providing the fairness and efficient administration of justice we need,” Williams continued. “I join with so many other elected leaders, and the Working Families Party, in urging Democrats to vote for her re-election in the Democratic primary on June 25.” Judge López Torres was elected to Civil Court in 1992 and re-elected in 2002; she was then elected to Surrogate’s Court in 2005. She was not the Democratic-backed candidate during her 2005 run, making her election a move that wasn’t easy to pull off. In addition, independent runs like hers usually mean that it is hard to gain support the next time around. When she won back in 2005, The New York Times proclaimed that, “shattering stereotypes is her mission.” Others who have already endorsed Justice López Torres include Assemblymembers Peter Abbate, Rodneyse Bichotte, Robert Carroll, William Colton, Maritza Davila, Erik Dilan, Joe Lentol, Walter Mosley, Nick Perry and JoAnne Simon; state Senators Velmanette Montgomery, Roxanne Persaud and Diane Savino; and Councilmembers Brad Lander, Alan Maisel and Kalman Yeger. López Torres also has the backing of many of the borough’s top political clubs and organizations including the Working Families Party, the Brooklyn Young Democrats, Central Brooklyn Independent Democrats, Independent Neighborhood Democrats, the Jim Owles Liberal Democratic Club, the Kings County Democratic Executive Committee, North Brooklyn Progressive Democrats, Lambda Independent Democrats, the Thomas Jefferson Democratic Club and the Vanguard Independent Democratic Association, as well as that of 31 district leaders. Justice López Torres was a chief lawyer for the city’s Child Protection Agency and director of family law at Brooklyn Legal Services before she joined the bench. She is also very active in many of the local bar associations including the Brooklyn Women’s Bar Association, the Brooklyn Bar Association and the Bay Ridge Lawyers Association. BWBA president Carrie Anne Cavallo honored Maria Aragona, president of the Federation of Columbian Lawyers, and Andrew Wenzel were named Court Employees of the Year during a ceremony at the Brooklyn Supreme Court, Civil Term, on Tuesday. Aragona is the law clerk to Hon. Kenneth Sherman and Brooklyn Eagle photo by Rob Abruzzese Wenzel is the law clerk to Hon. William Harrington. NOTICE OF QUALIFICATION OF 282 COMMON MEMBER LLC. APP. FOR AUTH. FILED WITH SECY. OF STATE OF NY (SSNY) ON 12/5/18. OFFICE LOCATION: KINGS COUNTY. LLC FORMED IN DELAWARE (DE) ON 12/4/18. SSNY DESIGNATED AS AGENT OF LLC UPON WHOM PROCESS AGAINST IT MAY BE SERVED. SSNY SHALL MAIL PROCESS TO: C/O THE LLC, 201 JAY ST, STE 201, BROOKLYN, NY 11201. DE ADDRESS OF LLC: 874 WALKER RD, STE C, DOVER, DE 19904. ARTS. OF ORG. FILED WITH DE SECY OF STATE, 401 FEDERAL ST, DOVER, DE 19901. PURPOSE: ANY LAWFUL ACTIVITY. NOTICE OF FORMATION OF LIVE LEARN LOVEWELL, LLC. ARTS. OF ORG. FILED WITH SECY. OF STATE OF NY (SSNY) ON 3/14/19. OFFICE LOCATION: KINGS COUNTY. SSNY DESIGNATED AS AGENT OF LLC UPON WHOM PROCESS AGAINST IT MAY BE SERVED. SSNY SHALL MAIL PROCESS TO: 420 STERLING PLACE, APT 1, BROOKLYN, NY 11238. PURPOSE: ANY LAWFUL ACTIVITY. Name Change NAME CHANGE LEVITZ NOTICE IS HEREBY GIVEN THAT AN ORDER ENTERED BY THE CIVIL COURT, KINGS COUNTY ON THE 19TH DAY OF MARCH, 2019, BEARING THE INDEX NUMBER NC-000235-19/KI, A COPY OF WHICH MAY BE EXAMINED AT THE OFFICE OF THE CLERK LOCATED AT CIVIL COURT, KINGS COUNTY, 141 LIVINGSTON STREET, BROOKLYN, NEW YORK, 11201, GRANTS ME (US) THE RIGHT TO: ASSUME THE NAME OF (FIRST) CHANITA (LAST) LEVITZ. MY PRESENT NAME IS (FIRST) JUDY (MIDDLE) ANNE (LAST) STORCH AKA JUDY ANNE LEVITZ AKA JUDY ANN LEVITZ AKA CHANITA LEVITZ AKA JUDY ANN STORCH. THE CITY AND STATE OF MY CURRENT ADDRESS ARE BROOKLYN, NY. MY PLACE OF BIRTH IS NEW YORK, NEW YORK. THE MONTH AND YEAR OF MY BIRTH IS JUNE 1950. THE RIGHT TO: ASSUME THE NAME OF (FIRST) YUSUF (LAST) IBRAHIM. MY PRESENT NAME IS (FIRST) YUSUF (MIDDLE) AHMAD (LAST) KARKOTLI (INFANT). THE CITY AND STATE OF MY CURRENT ADDRESS ARE BROOKLYN, NY. MY PLACE OF BIRTH IS BROOKLYN, NY. THE MONTH AND YEAR OF MY BIRTH IS MARCH 2012. KINGS COUNTY ON THE 19TH DAY OF MARCH, 2019, BEARING THE INDEX NUMBER NC-000315-19/KI, A COPY OF WHICH MAY BE EXAMINED AT THE OFFICE OF THE CLERK LOCATED AT CIVIL COURT, KINGS COUNTY, 141 LIVINGSTON STREET, BROOKLYN, NEW YORK, 11201, GRANTS ME (US) THE RIGHT TO: ASSUME THE NAME OF (FIRST) GREGORY (MIDDLE) JASON (LAST) WYATT. MY PRESENT NAME IS (FIRST) GREGORY (MIDDLE) JASON (LAST) HUNTER AKA GREGORY J WYATT AKA GREGORY JASON HUNTER AKA GREGORY JASON WYATT. THE CITY AND STATE OF MY CURRENT ADDRESS ARE BROOKLYN, NY. MY PLACE OF BIRTH IS QUEENS, NY. THE MONTH AND YEAR OF MY BIRTH IS FEBRUARY 1982.